Although he is shown as being a Seattle Pilot on the card- he never played with the Seattle Pilots- he was traded in late March 1969 to the Baltimore Orioles. Also in the photo you can clearly see that when the picture was taken he was a Cleveland Indian. A career utility player- mostly and infielder but Salmon played every position in the major leagues but pitcher and catcher. He started with the Cleveland Indians 1964- 68, was taken in the expansion draft by the Seattle Pilots but traded at the end of spring training in 1969 to the Baltimore Orioles where he would play until the end of his career in 1972. Overall nine seasons he played in the majors. He hit and threw right handed, was 5’10 160. He was 23 when he broke in with the Indians and 31 when he played his final MLB game. His was born in Colon, Panama -Rutherford Eduardo Salmon. His career stats- 31 home runs, 149 RBI .249 batting average and a .290 on base percentage. He had fine speed stealing 46 career bases. 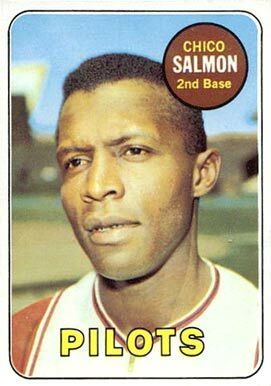 Salmon’s best season was 1966 with the Indians- 7 home runs, 40 RBI’s and a .256 average. He played in 126 games which was a career high. He only played in more than 90 games twice in a season. He was well traveled before making his major league debut in 1964. He was signed by the Washington Senators in 1959- and also played in the San Francisco Giants, Detroit Tigers and Milwaukee Braves organizations. His 1969 trade from Seattle to Baltimore is big for one reason. Jim Bouton’s classic Ball Four was written on the 1969 season and coming from Baltimore to the Pilots in the trade was pitcher Gene Brabender who would be one of the big characters in the book. With the Orioles Salmon played on the three Oriole World Series teams 1969-71- winning once in 1970. He only played in one World Series- 1970 where he went 0-1. Chico Salmon died on September 12, 2000 at the age of 59 of a heart attack.